I think it's pretty obvious why this photo is so awesome. It was one hundred percent unscripted. Just look at the joy and happiness on both the bride and groom as they are about to see each other for the first time on their wedding day. This was pure raw emotion coming out of both the bride and groom, and I loved it. This image is one of my favorite first look images. Although it is very popular among American weddings, it is now starting to become very popular among Pakistani weddings as well. A first look in a Pakistani wedding is not too uncommon anymore. No matter what type of wedding, I highly recommend having a first look for a number of reasons. The first and most important reason-so that the bride and groom have some time to themselves during the busy day. While it is a blessing to be surrounded by family and friends on your big day, it is also nice to see emotions like this between the bride and groom-and that is possible only when they have some alone time. Just a few minutes is all that is really needed. 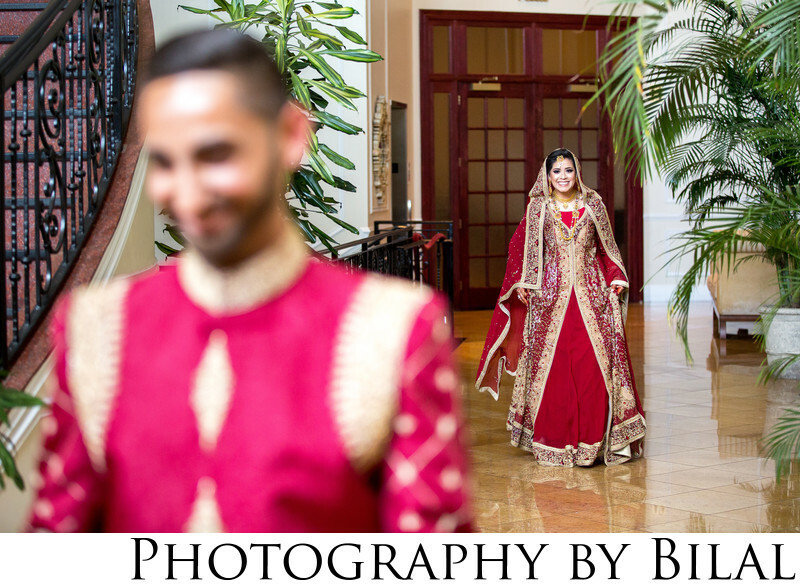 The first look normally happens before the ceremony, or in the case of a Pakistani wedding, before the bride and groom sit together on the stage. Location: 1301 Route 130 S, Cinnaminson, NJ 08077.